Let’s take a well-deserved break from manufacturing and tax policy and cheer things up with a post on threats to the current recovery. As I’ve stressed, IMHO we’re not yet into the virtuous cycle where we can count on above-trend growth to generate jobs, which boosts paychecks, which supports consumption, which signals investors to get into the game, which leads to more growth, etc. But we’re headed there. The best evidence for that is the improving job market—that’s been the missing link in the above cycle. Outside of public sector job losses—there’s your first ongoing threat—net payroll gains have accelerated in recent months and that’s helped to nudge down the unemployment rate which has ticked down by one or two tenths every month since last September. 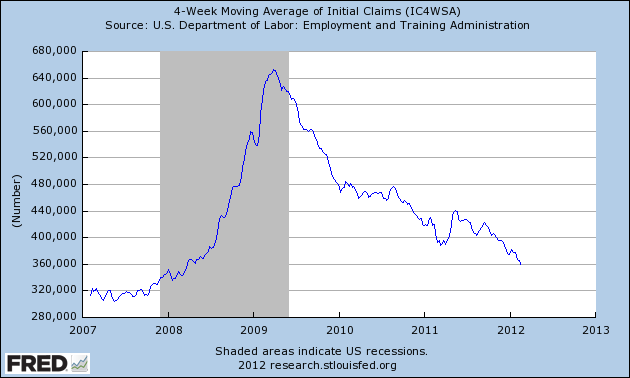 In that spirit, the first two figures show steady, favorable trends in the four-week average of unemployment insurance claims, closing in on pre-recession levels, and the number of job-seekers per job opening, which has recovered about half of its losses since the downturn. The conventional list is Europe, oil, and fiscal drag—which, to me at least, are ordered least to most worrisome (though “least” doesn’t mean “not”). On fiscal drag, I offer this handy update from GS analysts which quantifies its impact in percentage points of GDP, including the impact of the just passed extension of UI and the payroll tax break (which helps prevent a bit more fiscal drag this year). Compared to the others—though oil’s a close second—this one worries me the most because a) we see the damage each month with the state/local job losses, and b) given the current Congress, it’s not going to improve. The other two can certainly bite us, but we can’t know with certainty which way they’ll bounce. On Europe, I see three pieces needing to come together, and in the Lucy-with-the-football way this has consistently evolved, they too are moving forward. They are: Greek restructuring, Troika stability fund (IMF, EU, ECB), and the ECB stepping up to plate with more aggressive purchasing of sovereign (through its members’ banks). Don’t get me wrong—recession already appears to be once again upon the land over there, in no small part austerity-policy-induced. So real risk here, but compared to say the previous figure on fiscal drag, my median estimate is that Europe shaves 50 bps (half-a-percent) off of US GDP growth this year. There are, however, other moving parts. As the President has pointed out, the payroll tax break is helpful in this regard, as is the fact that at least so far in the Great Recession and its aftermath, people have responded more elastically to higher gas prices (and income losses) by driving less, as shown in the figure at the bottom here. The tax break is also important because real wages (pretax) have been about flat of late, which is actually an improvement over a few months ago. The US EIA—a wonderful source for info on such things—predicts pump prices to go up only a slight bit more, as shown below. 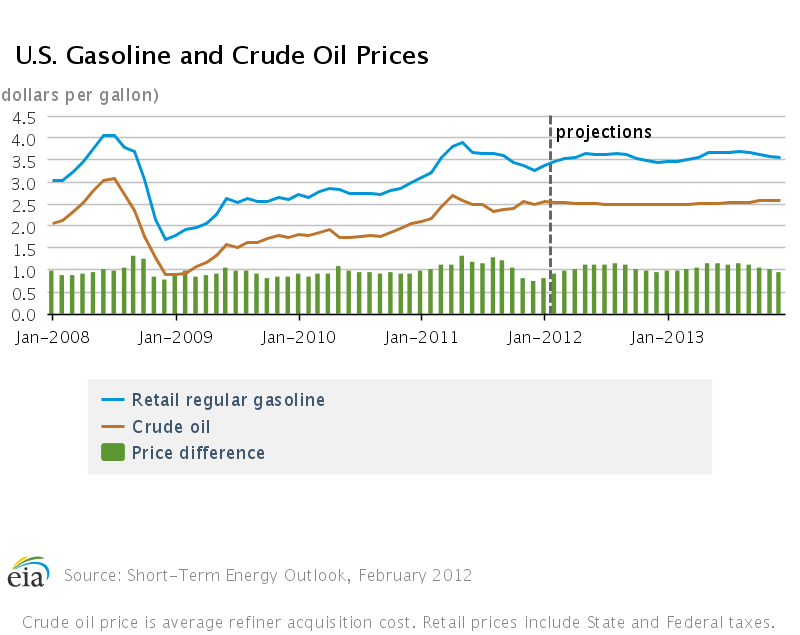 Clearly, they’re not predicting $4/gallon or above, but who knows? Though slower growth in China has been a bit of a pressure valve here, global oil capacity is once again tight, as are geopolitical tensions vis-à-vis Iran. So this tops my list of nervous makers. Re housing, it’s bumping along the bottom but not getting much better. The best you can say—and this is relevant for this threat survey—is that we’ve largely flipped from housing bringing down the economy to the economy keeping down housing. If jobs and income continue to grow apace, or better yet, accelerate, we should see some new household formation and new demand for housing, especially given such low mortgage rates, but the system isn’t there yet. There are still millions of foreclosures in the pipeline and prices of distressed sales—short sales and foreclosed properties—continue to decline pretty sharply (the research group CoreLogic helpfully keeps track of these measures). I’ve written in the past that as long as the share of distressed sales continues to fall, and the prices of non-distressed sales continue to hold up better than the distressed sales, we should be able to carve out a bottom on home prices. 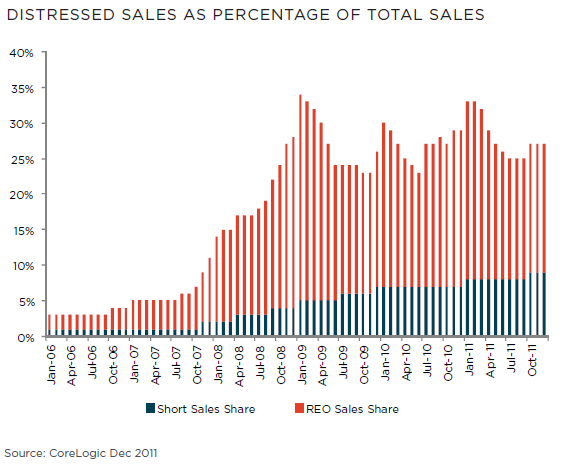 But alas, as the CoreLogic figure below shows, the share of distressed sales hasn’t come down much at all. So the housing sector isn’t much of a threat but it ain’t helping much either. Finally, one specific threat to the unemployment rate: the share of the population participating in the labor force remains quite low. That has actually helped in terms of getting the unemployment rate down, since if you’re not in the labor force, you’re not counted as unemployed. But if the participation rate begins to bounce back up—e.g., if the improving economy pulls more sideliners back in—that will put upward pressure on the unemployment rate. 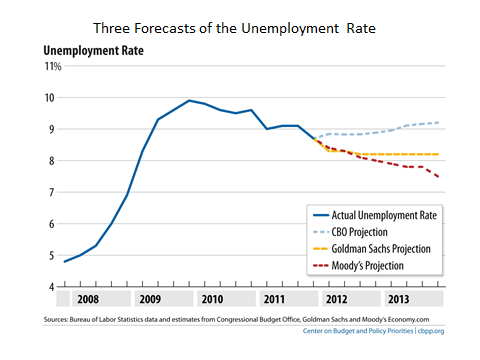 The last figure shows three forecasts of the unemployment rate over this year and next: CBO, Goldman Sachs researchers, and Moody’s Analytics. CBO is the most pessimistic, but that’s because they assume the “current law” baseline which includes huge tax increases and spending cuts all hitting the economy at once next January. The full sunset of the Bush cuts along with sequestration (automatic budget cuts) leads to a decline in the 2013 budget deficit of about $500 billion. Only the most bloodletting austericons could stomach a fiscal contraction of that magnitude at that point in the cycle. 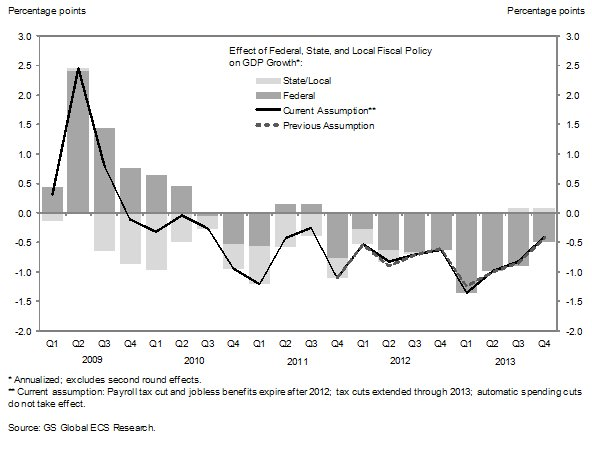 Sources: BLS; GS US Economics Analyst, Feb 17; Moody’s Analytics, Feb 2012. The Moody’s team is most bullish, based on the improving job market boosting consumer income and investor confidence. GS forecasts GDP growth at about trend, so the jobless rate stays around where it is now. I don’t think we’re likely to let the current law baseline prevail, so I’d say stick with GS but hope for Moody’s to be right. All told, we’re into a real recovery, but it remains fragile, it is not yet self-sustaining, and risk factors lurk out there. What worries me most is the lack of a public policy cushion such that if one of those risk factors flared up, we could count on policy makers to fight back. Jeez…imagine that. Share the post "Threats to the Current Recovery"
7 comments in reply to "Threats to the Current Recovery"
This is pointless. The moment things get a little better, the banksters will take all the money to the casino and cause another crash, which will require another bailout. Until Obama stops viewing himself as President of Goldman Sachs and starts viewing himself as President of the United States, nothing gets better. Want a good example of fiscal drag? Note how the problem is not a tax increase but that a tax increase isn’t enough. Compelling! However, I am interested in what model you are using to calculate Europe’s .5% slag on US GDP growth. Just in running some quick numbers, a .5% deficit in growth, from the most recent 2011 BEA GDP estimates, comes out to about 76.5 billion dollars in losses. Compared to the latest US Census data, which lists in 2011 99.1 billion dollars, or .6% of GDP, it would almost appear as if your model parallels slagged growth to trade deficits–and though I certainly don’t want to put any econometrics in your mouth, this rationale would push potential GDP growth percentages down as many as 370 bps. Bejeezus! Anyway, just looking for clarification on your thinking. My two cents on the current EU economic calamity is that their loss could easily be our gain. Considering our largest trade imbalances are with countries tightening their belts: Germany, Ireland, Italy, France–it would seem that these countries’ abilities to compete globally are intrinsically diminished. Fewer government subsidies, social programs, R&D, or public investment would put a damper on any industry currently hedging their comparative advantage with federal Euros. Further, although you aptly point out that oil prices are plateauing, the same graph illustrates that prices are undoubtedly up from previous years. This equally global phenomenon suggests a multiplier on geographic economy, that it is cheaper to produce locally than to ship internationally. If so, would this not point towards more US domestic production to saciate AD, leading to jobs, leading to spending. Lastly, with the Fed practically giving money away at subterranean interest rates, the gears appear well lubed for expansion locally. The incentives seem irresistable. Thoughts? This summary is great. Please keep up the good work! 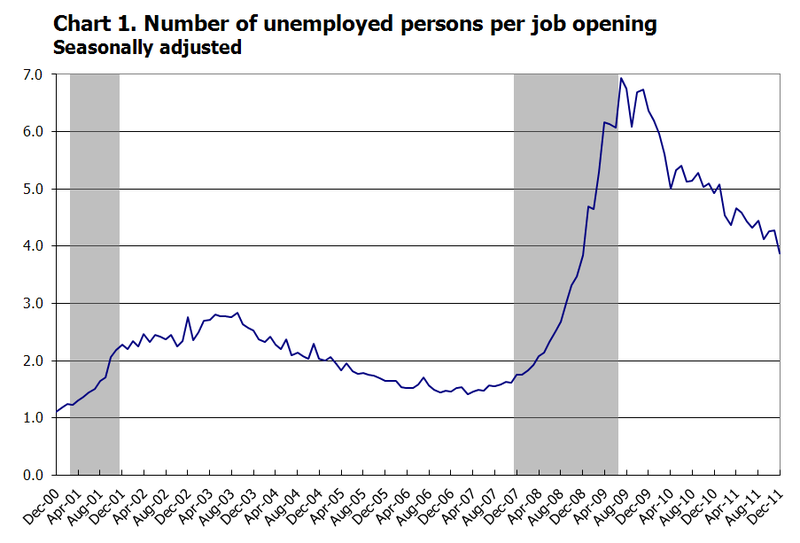 Fewer applicants per job, yes! But fewer GOOD jobs for those same applicants. Serfdom always had plenty of participants. It was the Guild jobs that paid the bills.